Tag: Religion | Something Odd! Gay Byrne interviewed Stephen Fry for RTÉ programme, “The Meaning Of Life”. The full episode goes out on Sunday evening. While the video above has gone viral in Ireland (and maybe further afield), if you haven’t seen the Intelligence Squared debate on the motion that, “The Catholic Church a force for good in the world.” it’s well worth watching. Stephen Fry and Christopher Hitchens decisively argue against the motion. There’s also a short video of Stephen’s contribution to the debate if you don’t want to sit through the two hour video above. 5 years ago the ship “Logos Hope” visited Cork. I had no idea what they were about but we visited and didn’t take long to figure out they were not exactly rational. 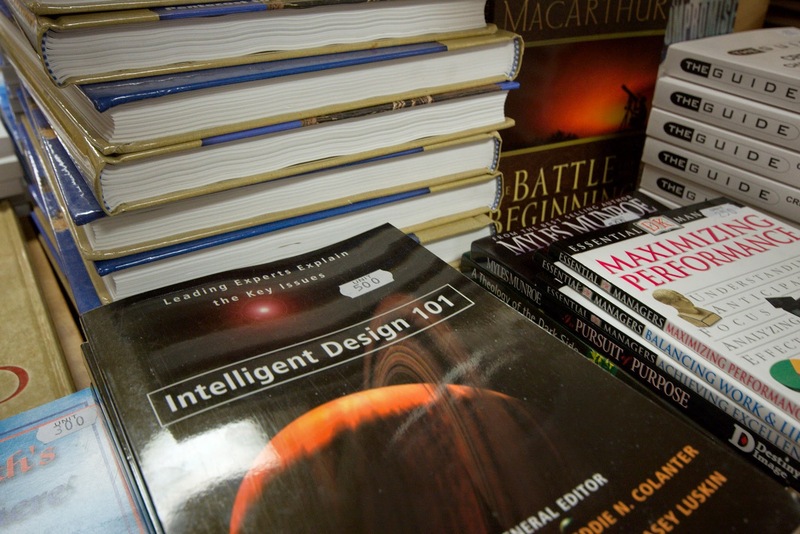 “Intelligent Design 101” is only one of many such books on sale in their bookshop. We got out of there in a hurry! In a thousand years time what will they say? The Islamic faith has particular rules regarding personal hygiene when going to the toilet. This code is known as Qadaahul Haajah  and is extremely prescriptive. The rules were established during times before the invention of toilet paper or toilet seats. In many parts of the Muslim World, squat toilets are the norm and toilet paper remains rare and its use a matter of dispute. It should be borne in mind that none of the following points is contained within the Koran and all are derived from hadith sources and the collected opinions of people throughout history. The Koran is silent on any of the issues below including issues of sidedness such as whether one uses the left or right hand, order of stepping into or out of toilet areas, or which foot stress is placed upon. The only issue which it does touch upon in relation to toileting, is the one of washing one’s hands especially following going to the toilet which is mentioned in verse 5:6 of the Koran. I recall from the interview Ray D’Arcy asked the woman if the Koran said that squat toilets should be used. She artfully dodged the question by replying that Muslims use squat toilets all over the world, while also implying that it was in the Koran if I remember correctly. As Islam is now the third largest religion in Ireland I think the sales of new toilets might be affected by future trends..